Heat oven to 400º F. Grease bottom of a large baking pan and bottom and sides of a muffin tin pan. Place the pizza dough on the counter. Evenly sprinkle the parsley across the dough. Flip dough over. Arrange ham to cover entire surface. Sprinkle sausage and bacon on top of ham. Starting on a short side of the dough roll it up. Using a large butcher knife cut the dough into 20 slices. Place each slice on the baking pan. Re-press the dough into a circle and make the tops even by using your fingers to press down on the dough (this should fill in gaps as well). Bake at 400º F for 10-15 minutes or until lightly browned. In medium bowl, combine eggs, milk, salt, and pepper; beat well. Pour an 1/8th cup of the egg mixture into 10 individual muffin cups. Bake at 400º F for 4-6 minutes or until the egg are cooked. Take 10 of the pinwheel slices and place on a serving plate. Place an egg on top of each pinwheel. Layer with a slice of cheese and top with another pinwheel. Serve warm. *I came up with this creation for the Pillsbury Bake-Off competition. I thought it would be fun to make a breakfast sandwich that incorporated the meat into the bread. These are SO flavorful! 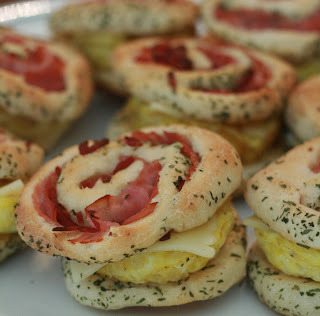 We loved making these yummy sandwiches for an easy Sunday brunch.